Mad genius or and idiot? We always go to the Tablo first to watch shows. I don’t even know when anything is on anymore. My wife and I had a series on Netflix to watch. We forgot about it and we have before. I needed to set myself a reminder but how? I could set a reminder on my phone but when? I don’t know when we will have a nice empty space in our viewing schedule. So where could I put a reminder? Today it occurred to me I can manually schedule a show, set it for 1 minute, and give it any title. Better yet. 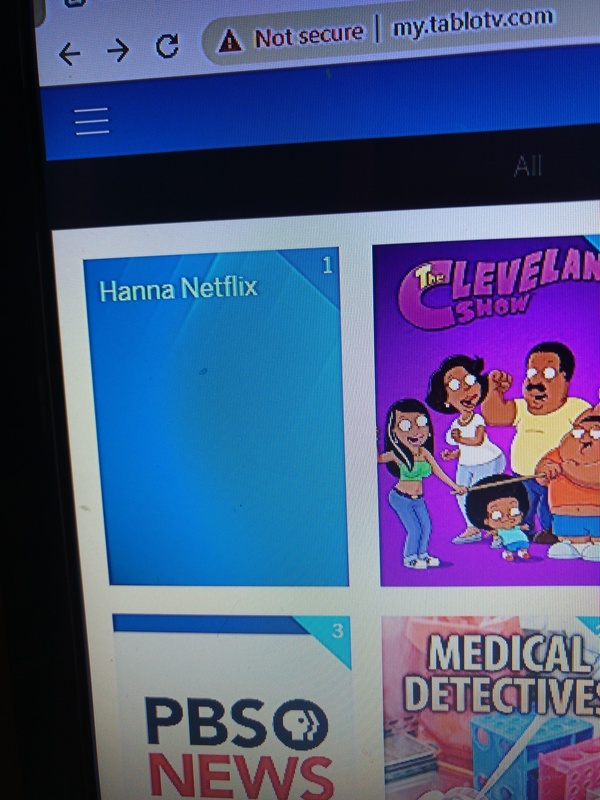 There are shows on some streaming network that come out once a week and I can set the recording (reminder) to repeat. EDIT:. Or is there some way I can use the Tablo API add my reminder automatically from an RSS feed? Ok, you sorta asked… The tablo will save the show indefinitely (not absolutely true). The genius would watch shows that have a chance of disappearing first. Ok mad genius, how is this so much different that setting a notice on your phone? How did you know when? Or just seeing it in the list… don’t let it get lost in the clutter. this wasn’t meant to offend, just some silly goofiness. I applaud your creative use of that feature. You could try using a site like Sidereel to help you keep track of what you’re watching. An app that can schedule recordings on a DVR based on the contents of an RSS feed is an interesting idea. Finding a developer interested in making it may prove difficult though. djk44883, can’t you set them to only keep the last recording? Who said I’m sitting? One of the benefits of the Tablo is that I can put my tablet on my treadmill and watch TV. how is this so much different that setting a notice on your phone? I watch TV across multiple devices. The notification is on the device I’m watching TV on at the time and my phone won’t get cluttered in the notification area. I don’t really want Notifications for DRs appointments mixed with “Black summer now on Netflix”. It’s really a context thing in a way. Or just seeing it in the list… don’t let it get lost in the clutter. I guess I’m just moving the clutter kind of. How did you know when? When I see a advertisement, when a show is coming back, When it’s a weekly thing. Social media. The genius would watch shows that have a chance of disappearing first. True but original shows on Netflix and Hulu don’t tend to disappear. Now if Tablo could just find a way to allow us to integrate our streaming providers. you mean, like Tivo’s done for…years and years now? Since Tablo is a “headless” DVR that puts it at a distinct disadvantage as to being integrated into an interface with other sources of content. djk44883 , can’t you set them to only keep the last recording? Well, it can save definitely - to the capacity of storage. So it can keep everything as long as you want… it’s not absolutely infinite, just clarifying. I don’t think it does. Tablo does a lot of it’s magic in the cloud, some on the Tablo unit, and some on the device playing the content. The main limiting factor would be cost. With the Tablo SDK available they wouldn’t even have to be the ones to implement the integration. Someone could integrate a front end app that searches multiple services and crosslinks them for playing in their native apps. Google does this in their search engine when you search stream _______ Google gives you options. Well, that doesn’t mean they can’t create an integrated “what’s on where” solution like what Tivo did. Ask for a show, put it on your list, and Tivo will tell you where in your specific world it is. It’s an out of the box idea, but not a bad one even for something like Tablo. Even better, Tablo is completely agnostic about where you find your content–they don’t care if you use their box or not. One might argue that “if you’re going to do that, just get Tivo where you can use one box, one remote, and one interface”–but really, I’m of the mindset of “who cares if I have to change inputs and use a streaming box instead of the DVR”. Someone could integrate a front end app that searches multiple services and crosslinks them for playing in their native apps. I think tablo blurs lines, or maybe it’s my perspective as an admitted idiot. Tablo is an OTA DVR - performing like an internet streaming device. Ok, wait, yes it is a streaming device, still it’s primary function is a tv tuner used for recording programs. Apparently most users integrate it along with internet streaming devices and services. They may not recognize it’s fundamentally a tv tuner - with the ability to watch on multiple devices across your local network (providing you give it internet access). Tablo does a lot of it’s magic in the cloud, some on the Tablo unit, and some on the device playing the content. Seriously? How much , even if you have cloud storage. I’m reasonably certain the tablo does most of the processing tuning, transcoding and storing content. The playback device process the video output. So, here’s a thought: an app that can look at your subscribed services, plus your Tablo show list, and create a comprehensive and searchable guide of what’s available to you. JustWatch knows what’s on what streaming service; how simple would it be for them to do something like this (provided they had access to your specific Tablo information, or Tivo information, or whatever DVR you’re using). Neither “mad genius” or “idiot”. Maybe suffering from tablo savant syndrome. First, as you pointed out cloud storage. More importantly however all guide information comes from the internet and all picture art. The Tablo isn’t capable of using local guide data broadcast by TV providers even as a fallback. You can’t view your Tablo using a browser on a local computer if your internet is out. Commercial skip requires not just an internet connection but decent upload speeds since that is processed in the cloud. Remote viewing require internet. The time can only be set automatically through the internet. The Tablo can’t verify your subscription status. Most features of the box will cease to function without a working internet connection to the point that Tablo doesn’t recommend their device to people without an internet connection. I get that there’s a lot of “behind the scenes” stuff happening online aka the cloud. Commercial skip isn’t readily available so exclude that. The Tablo isn’t capable of using local guide data broadcast by TV providers even as a fallback. You can’t view your Tablo using a browser on a local computer if your internet is out. (Big disapointment) Yup, guide data including the graphics - everyone always says tablo doesn’t use “that much of your data”. Once it gets it, scheduling and organizing is local. Tablo gets https://api.tablotv.com/assocserver/getipinfo/ to find it on your network loads a web page… computer does most of the work here. an ntp request takes a moment… not clear how often it’s necessary. (for some reason my router does it every hour). Suddenly I’m wondering why no one has grumbled why we can’t choose our own time server!? Most features of the box will cease to function without a working internet connection to the point that Tablo doesn’t recommend their device to people without an internet connection. Most, actually it becomes useless without an internet connection, wasn’t disputing - just once it gets the important administration work out of the way… it doesn’t really have a lot going on in the cloud - generally.